I've been feeling challenged lately to pray more for my son. And not just a simple prayer of "God, please keep him safe today," but prayer about the deep things we tend to gloss over and ignore, such as discipline, his future decisions, his future wife, his salvation. ** I need to pray that God guide Dave and me to the correct parenting methods and forms of discipline that are appropriate for our unique child and situations. One single way of raising a child isn't going to work for every family. We need God's guidance in finding the discipline that will help our particular child grow to be a godly man. And we need wisdom for each individual situation, because clearly the parenting approach should depend on the moment at hand. Just as there is no blanket parenting approach appropriate for every child, there is no blanket parenting approach appropriate for every situation experienced with a particular child. Raising a child is a blessing and an impossible responsibility all in one. And I need to pray that God fills in where Dave and I fall short. ** I need to pray for Krewson's salvation. I have begun adding this into my prayer at various times of the day, especially when I'm putting Krew to bed and when Dave and I are praying at night. This is, without a shadow of a doubt, one of the most important things in my life. My son's salvation. I know my husband is saved, and I know I am saved. Next comes Krew. God has given Dave and me the responsibility of raising this child, and we will do all we can to direct him towards Jesus, but ultimately the decision will be between Krew and God. I know God listens to and answers prayer, so I will pray daily that Krewson will ultimately choose a path that leads to Jesus. All the rest in Krew's life is moot in comparison. Jesus is all that matters. ** Pray for Krew's future wife. I've heard of many parents doing this. It may seem like a weird thing to do, but really, wouldn't you like to pray for the person who will eventually become your child's other half, their most important person on this earth? Wouldn't you like to send up prayers for blessings on a person that you are going to love very dearly in the future? Wouldn't you like your child's future with his spouse to be unmarked by damaging past life events? Prayers make a difference! Start making that difference now! ** Prayers for Krew's future decisions. I cannot control every aspect of my child's life. I can set boundaries and consequences, I can teach him by example, but I cannot make his decisions for him. He is an imperfect and sinful human being. He is going to make mistakes. But if my prayers to heaven can lessen the number or graveness of those mistakes, then I'm gonna keep on praying. There are many many many more things to pray for in my child's life, but these are the items that are standing out the most to me at this time. I want to challenge all you moms and dads out there to pray for your children. Perhaps you want to pray for one of the things above, perhaps you have your own prayer concerns. Either way, your child could use your prayers, and God would love to have more conversation with you. So send 'em up. 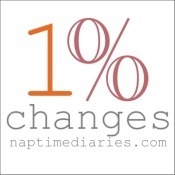 Linking up with 1% Changes over at Naptime Diaries. Head on over to encourage Jessi and the others who are trying to implement 1% Changes in their own lives.